A Beautiful Oakeshott Type XVIII sword. 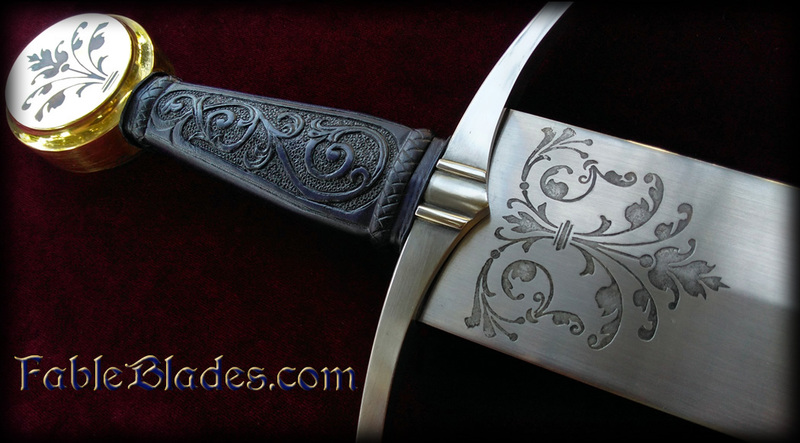 Arguably of the most practical and long used blade types in history, with it's equal prowess in the cut and the thrust, having seen use since bronze age weaponry.The style seen here was in prevalance in the 15th Century. 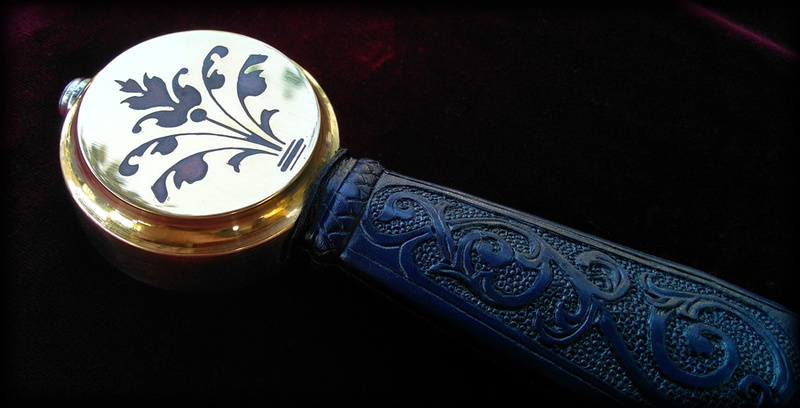 This agile sword features hand tooled and dyed leather with Acanthus motifs, which extend to the blade and pommel. Acanthus decor has an almost equally long running popularity, being used in Roman Architecture as early as the 5th century BC, and seeing popularity continue through the medieval and renaissance periods, as well as today. The Blue and Gold colour scheme impart an aura of French Royalty. Specification: Weight: 1,186g (2.6lb) Length Overall: 882mm (34.72") Blade Length: 725mm (28.54") Grip Length: 94mm (3.7") Blade Breadth: 60.25mm (2.37") Blade Thickness: 5.5mm at base > 4.1mm at CoP > 2.8mm at 5cm from tip. Point of Balance: 90mm (3.5") from blade shoulder Centre of Percussion: ~43cm (16.9") from Shoulder Hilt Node of Percussion: 6cm (2.36") behind guard, on grip. 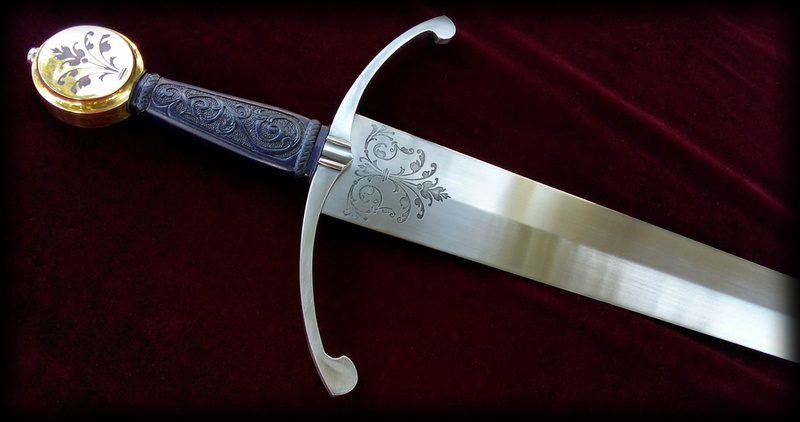 Materials: Blade is 9260 High Carbon Steel. Guard is Mild Steel, all hand fashioned. Pommel: Brass with Electrolitic etching. Mild Steel peen block. Grip is bovine leather over poplar core. All hand tooled and dyed. 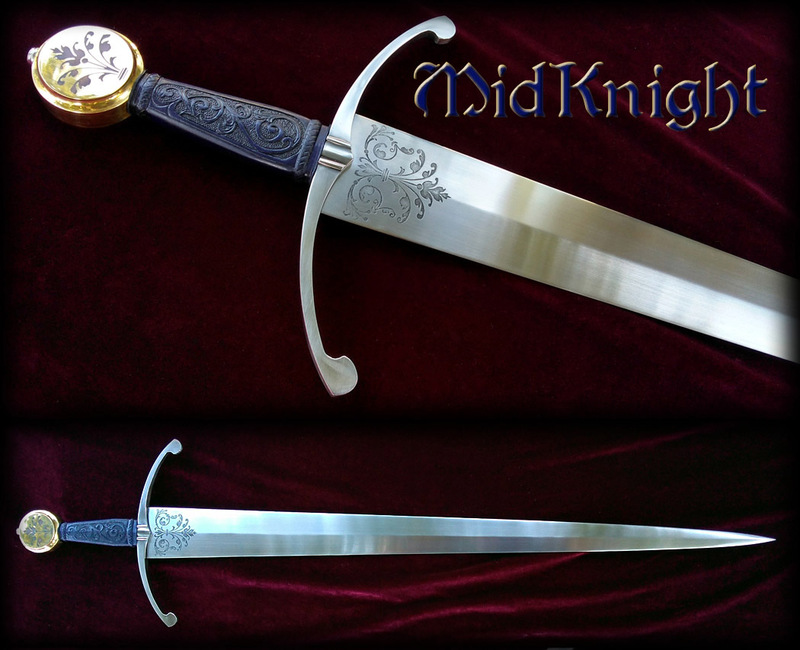 Weight: 1,186g (2.6lb) Length Overall: 882mm (34.72") Blade Length: 725mm (28.54") Grip Length: 94mm (3.7") Blade Breadth: 60.25mm (2.37") Blade Thickness: 5.5mm at base > 4.1mm at CoP > 2.8mm at 5cm from tip. Point of Balance: 90mm (3.5") from blade shoulder Centre of Percussion: ~43cm (16.9") from Shoulder Hilt Node of Percussion: 6cm (2.36") behind guard, on grip. Blade is 9260 High Carbon Steel. Guard is Mild Steel, all hand fashioned. Pommel: Brass with Electrolitic etching. Mild Steel peen block. Grip is bovine leather over poplar core. All hand tooled and dyed.